In 1973 while en route to an expedition in Patagonia, Rab Carrington found himself stranded in Buenos Aires. A dock strike in the UK had delayed the arrival of his equipment and he found himself in desperate need of money. Running out of both cash and ideas, Rab turned to his friend, Hector Vieytes, who had just landed a small contract sewing sleeping bags for the Argentinian Army. After much persuasion, Hector employed Rab and began teaching him the skills that would come to redefine the future of technical sleeping bags. To this day Rab makes the best sleeping bags in the world and regardless of whether you are going camping in the Lake District or planning an attempt on an 8000m peak, your choice of sleeping bag can mean the difference between a restful night’s sleep and shivering until dawn. The primary consideration when buying a new sleeping bag. What temperature rating you require depends on the climate and conditions you’re going to be dealing with as well as your personal preferences for sleeping temperature. Sleeping bags can be filled with natural down, the fine under feathers from ducks or geese, or with synthetic insulation, made from poly-fibres. We’ll look at the pros and cons of both filling materials. When choosing a sleeping bag, it is also important to consider the shape, fabrics and feature sets used in different types of bag. It’s important to understand that a sleeping bag does not warm you up – its job is to retain the heat that your body generates, preventing you from getting cold. Our ratings describe how well a sleeping bag retains heat when the air exterior to the bag is at a certain temperature. Because all of our bodies are different, what one person needs for a good night’s sleep is not necessarily the same as the next. This means that it is difficult to quantify exactly how warm a sleeping bag is and as such, any rating should be treated as a guide. At Rab, we use the European EN13537 standard to rate the majority of our sleeping bags. EN13537 is a European standard designed to regulate the temperature ratings of sleeping bags across the industry. The test assumes that a ‘standard man’ is 25 years old, 1.73 m tall and 73 kg, while a ‘standard woman’ is 25 years old, 1.60 m tall and 60 kg. The EN13537 rating is determined by using a thermal mannequin to accurately record a series of measurements from the ‘Upper limit’, the temperature at which a person can sleep without perspiring, all the way down to the ‘Extreme limit’, which determines the minimum temperature at which a person can survive. For our EN13537 tested sleeping bags we list the three lowest temperature ratings; comfort, limit and extreme as well as our own Rab Sleep limit. This rating expresses the optimal temperature you’ll experience when wrapped inside your sleeping bag. You should use the Comfort rating as the basis for your purchase. The ‘Lower limit’ measurement is the temperature at which the test’s ‘standard male’ can remain asleep for eight hours without waking due to heat loss. The extreme rating expresses the absolute limit of a sleeping bag. It should be used to guide how a bag would perform in an emergency situation rather than a recommended use case. It refers to the temperature at which a ‘standard female’ can remain for six hours without risk of death from hypothermia. We have created the ‘Rab Sleep Limit’ to supplement the standard EN13537 results. It is not an ’emergency’ metric in the same way as the ‘Extreme Rating’ rather what we believe the bag’s usable limit to be. The Rab sleep limit is what we believe the sensible limit of the bag to be from past experience and feedback from our athletes. ﻿Some manufacturers rate their sleeping bags as being 1-5 ‘season’. Because our customers, and particularly our athletes, take their gear to such varied locations and climates, using a season rating ceases to make sense. For example, 4 seasons in the Mediterranean are different to 4 seasons in Antarctica. Instead, we stick to temperature ratings, as these are applicable wherever you choose to sleep. There are two main types of insulation used in our sleeping bags; hydrophobic down and synthetic insulation. Our down filled sleeping bags have a superior warmth-to-weight ratio, are highly compressible and, with proper care, can last a lifetime. They can have their drawbacks though. Excessive moisture may cause down to lose its loft and impair its ability to insulate and aftercare of down is not as straight forward as synthetic insulation. Down are the clusters of fine tendrils and fibres that exist beneath the feathers of ducks and geese. The amount of air that these fine structures are able to trap relative to their weight make them incredibly efficient insulators and their low mass means that our down sleeping bags are very packable. Down’s primary weakness is that it is susceptible to moisture ingress which can lead to the clusters collapsing and losing their insulative properties. Here at Rab, we protect our down with a Nikwax Hydrophobic Down™ treatment. Hydrophobic down will absorb far less moisture and dry far faster than other down. However, it is still unable to perform as well as synthetic alternatives in wet environments. Down is a huge commodity worldwide now and can be sourced in a wide variety of claimed fill powers and qualities. At Rab®, all of our down is European in origin and is sourced and processed by our partner of many years in Germany. Long relationships build trust and we know that this is the only way to ensure the quality and performance synonymous with Rab® sleeping bags. We use only the highest quality down in our sleeping bags all of which is fully traceable and accredited under the Responsible Down Standard to ensure animal welfare. 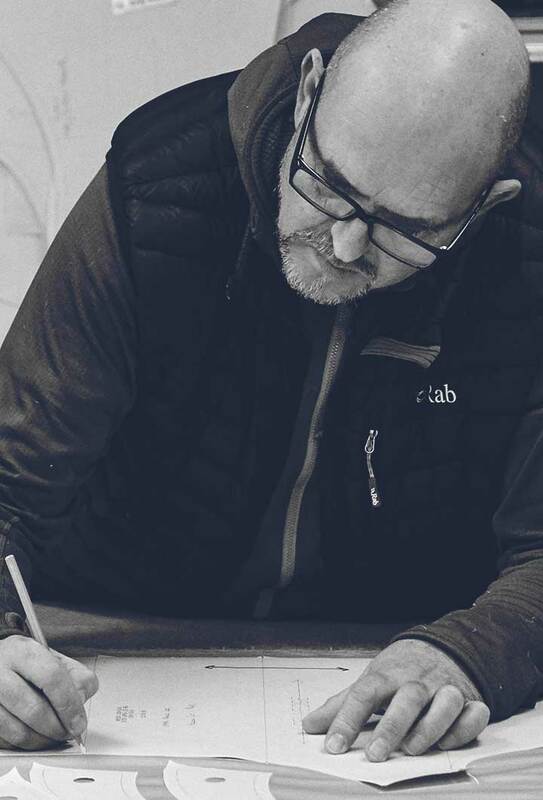 Because down is a natural material it can vary in each grade, so each and every batch we use is independently tested to guarantee our exacting standards. 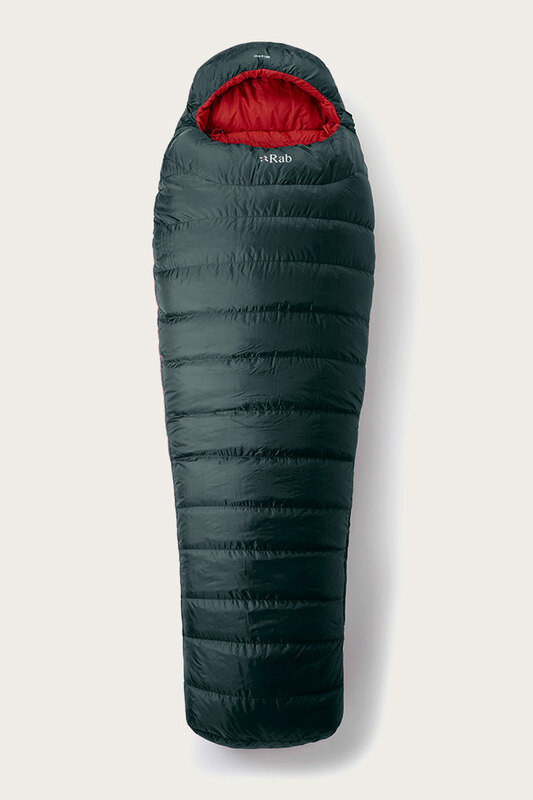 Fill weight is the primary factor in the warmth of a down sleeping bag. It refers to the total amount of down used in the bag’s construction and is usually measured in grams. 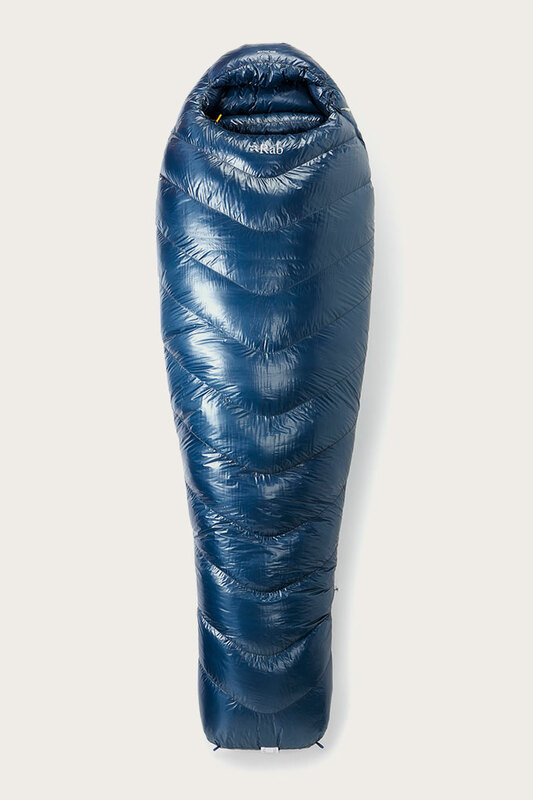 Generally speaking, the more down inside a sleeping bag, the warmer it will be. If you were to take 1 gram of fully lofted down and measure its volume, the result would represent the down’s fill power. The higher the volume, the more air that can be trapped and the better the down is at insulating. Goose down usually has the highest fill power, typically ranging between 600 and 850 while duck down will usually have a fill power that varies between 500 and 700. The range of down that we use allows us to fine-tune our sleeping bags to meet the differing demands of our customers, both in terms of budget and the bag’s intended use. Warmth is the primary concern when buying a sleeping bag but it is also important to consider both the weight and pack size. It is possible for two sleeping bags to have a similar temperature rating but very different weights and packed sizes. For some people, warmth is the only concern. If you’re arriving at your camping location by car or setting up a basecamp then a bulky, heavier bag might be fine, but if you’re carrying your gear in the mountains, then every gram is important. For example, if you compare two of our bags, the Neutrino Endurance 400 and the Summit 600 they both have a similar temperature rating, (-6°C and -6.5°C respectively), but the Neutrino Endurance is 285g lighter and packs down to 18 x 27cm rather than the 22 x 39cm of the Summit. Both bags will keep you warm, but if you’re travelling light or have limited space in your pack, then the Neutrino Endurance is clearly the better choice. The trade off is that the 800 fill power down used in the construction of the Neutrino Endurance 400 makes it considerably more expensive. All of our sleeping bags come with a stuff sack, some of which are waterproof. If you are storing your down sleeping bag for an extended period, we do not recommend using a stuff sack as this can impair the down’s natural loft. To avoid this, we also provide you with a much larger, cotton storage bag for when your bag is not in use. 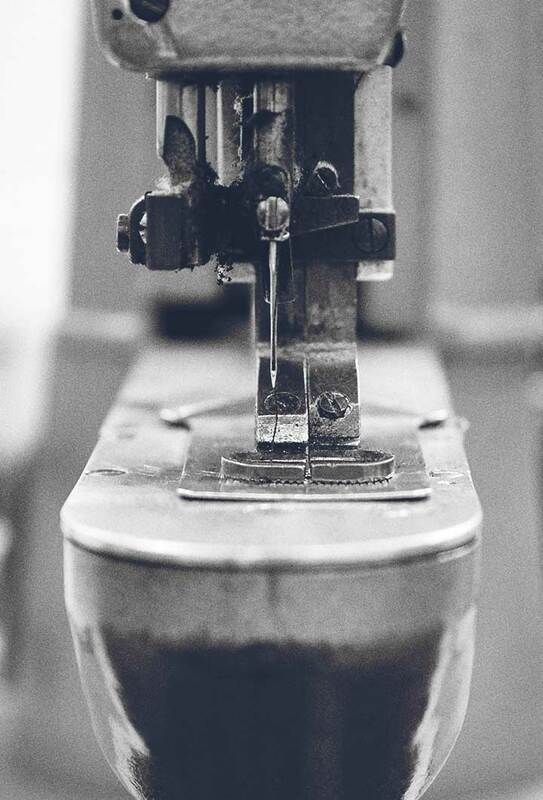 The bags we make can mean the difference between life and death, and so to this day we hand-fill all of our down sleeping bags at our factory in Derbyshire, UK. It means that we can ensure that every baffle is filled as required and that the down within has never been compressed or stored in a way that could impair performance. We simply would not trust anyone else to do it. How are the bags filled? The bags are filled using a small diameter pipe and a compressed air system, which blows the feathers into each chamber. Before the bags are filled, one empty shell from each batch is weighed to ensure they are within tolerance. Precision scales are then used to measure the down for each chamber and, once complete, the finished bag is weighed again. To avoid being rejected the bag’s total weight must be less than 10% over and cannot go under the intended weight. Our scales are accurate to 0.5g and are routinely re-calibrated using weights of 1000g, 100g, 10g and 1g. Although Rab is primarily known for down sleeping bags, there are instances in which synthetically insulated bags are appropriate. In contrast to non hydrophobic down, synthetic insulation is better at dealing with moisture and will keep you warm even when wet. It is also easier to clean and care for and is generally cheaper than down but importantly, it does have a lower warmth to weight ratio. In our ignition range we use Pyrotec™, a synthetic insulation developed exclusively at Rab to provide the best possible balance of softness, compressibility and warmth vs weight. Pyrotec™ is created by meshing microfibers and hollow core fibres into sheets – the microfibers provide softness, flexibility and heat retention whilst the hollow core fibres add loft and spring to the material. Although generally heavier and less efficient at retaining heat than their down equivalents, the performance of our Pyrotec™ bags is inhibited far less in damp environments. They are also far easier to maintain. 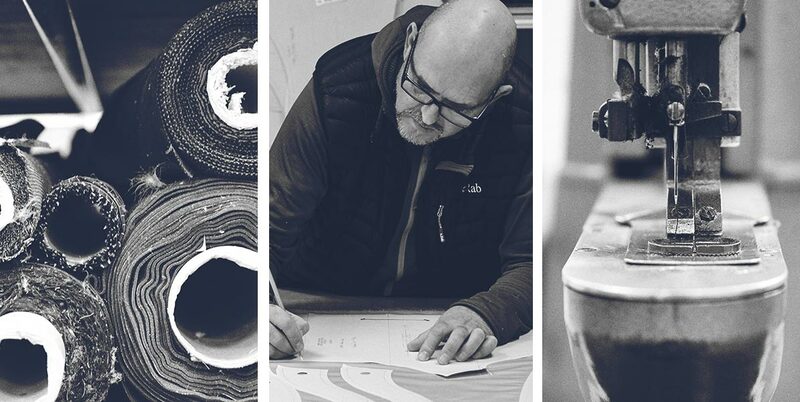 As you explore our range of sleeping bags you will notice the differences in their features, their shape and the fabrics we use to build them. Below we highlight the key features to look out for. When we use the term baffle it is in reference to a ‘baffle mesh’ – the walls of fabric that divide a boxwall sleeping bag into chambers. The height of a baffle is determined by the measure between the lining of the sleeping bag and the outer shell. Down with a higher fill power, or a higher fill weight will require more space, but too much baffle height makes the shell saggy, adds weight, and allows cold spots to occur. Conversely, too little baffle height can restrict the down’s ability to loft, resulting in an under-performing bag. 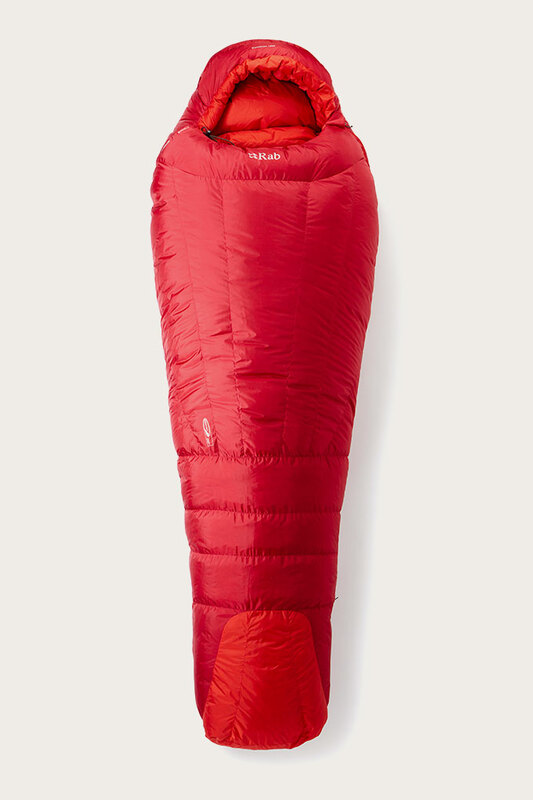 Differential cut is the difference in size between the inner and the outer shell of the sleeping bag. When looking at a particular series of sleeping bags, the inner shells will usually be the same size but the outer shell may need to increase to accommodate a higher weight of down or down of a higher fill power as you progress up the range. Regardless of fill power or fill weight, if a sleeping bag is too big, you will lose heat. We offer standard size, women’s fit and extra long sleeping bags to help accommodate different body sizes. Our Expedition series bags are slightly over-sized to accommodate the bulky down clothing required in extreme environments. Shape is another important consideration, most Rab bags either use a ‘Mummy’ or ‘Tapered Mummy’ shape. Mummy shaped bags are broad at the top to accommodate your shoulders and narrow slightly towards the feet to prevent gaps and drafts. 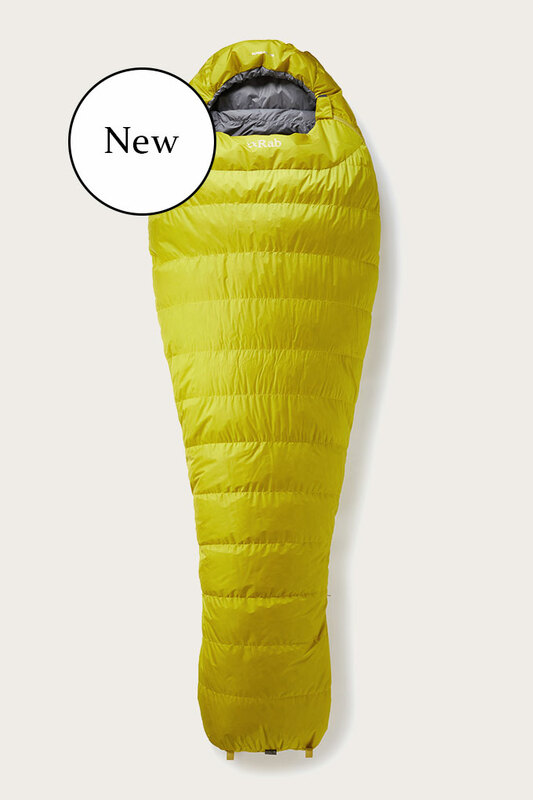 Tapered bags, like our Neutrino range, are closer fitting and are narrower in the leg than Mummy shaped sleeping bags. This means they weigh less and are more thermally efficient, but they can also feel a little constrictive. 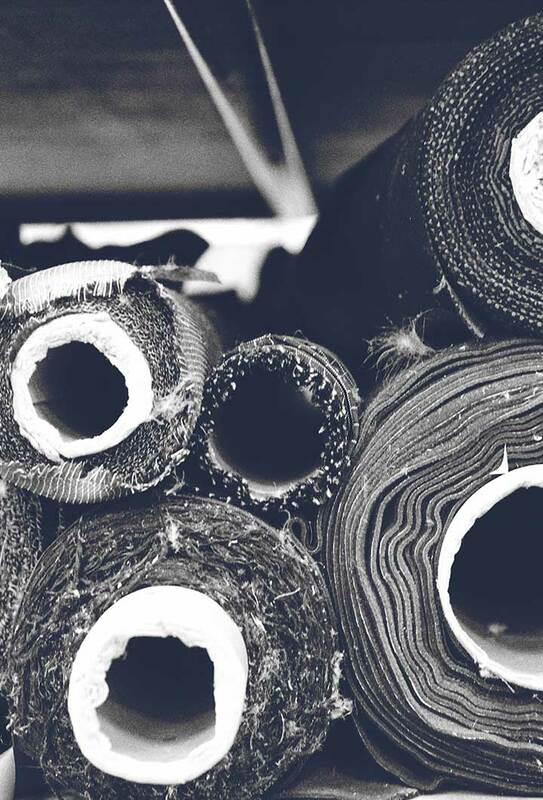 We use a range of fabrics across our range. Some situations require the lightest possible fabric whilst for other users, durability or water resistance may be of more importance. Uncoated outers such as Pertex® Microlight, are breathable, light and easy to pack but do not offer as much protection against moisture as a fabric such as Pertex® Endurance. For example, our Neutrino Endurance range of bags have better moisture resistance and are more durable than the Neutrino range but at the cost of 85g and lower breathability. To reduce the amount of heat lost through your head, all of our bags feature shaped hoods and adjustable neck baffles. The addition of a draw cord allows you to pull the hood tight against your face to retain as much heat as possible. All of our sleeping bags use lightweight and breathable nylon fabrics such as Pertex® Quantum for their inner linings. These are generally tougher than polyester equivalents. Some lower-end bags may use fabric linings, but these add weight and increase the packed size of the bag. Our range of sleeping bag liners are there for when you want an extra level of comfort. They can also mean that your bag will require less frequent washing and can add warmth. A zip is often an insulative weak spot in a sleeping bag. We minimise this by using draft tubes – a pipe of insulation that runs behind the full length of the zip. We also sell sleeping bag liners which are available in silk and cotton. Our liners protect the sleeping bag from regular use, giving a boost to durability and hygiene, and add an extra degree or two of warmth in colder conditions. Rab sleeping bags are used across the world from the highest alpine peaks and polar expeditions to the hills and dales of our native UK. Because of the huge variety of different uses to which our bags are put, we produce a number of different sleeping bag ranges that, at first glance, can be a little overwhelming. To help you make sense of it all, below you will find a quick summary of each of the ranges. The pinnacle of sleeping bag innovation, the Mythic range use 900 fill-power down weight-saving baffle construction that keep down packed around the center of the body to achieve the best warmth to weight ratio of any of our sleeping bags. 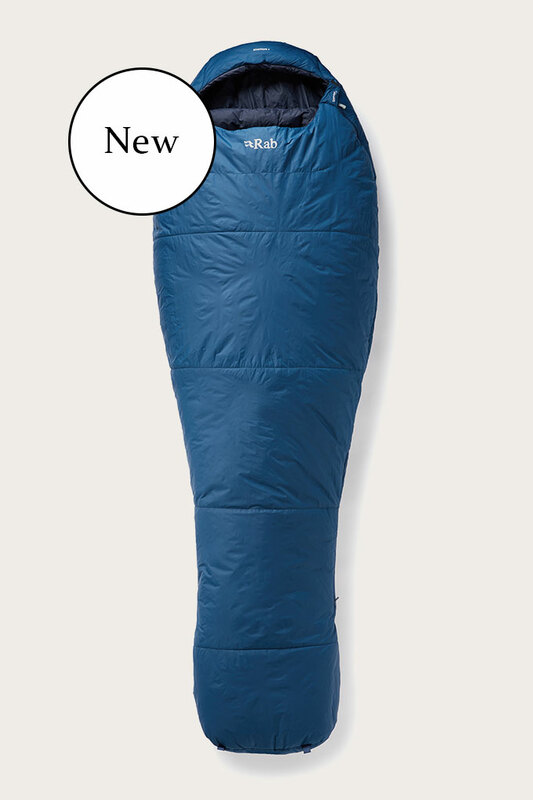 The Expedition range of sleeping bags are the warmest in the Rab® range. Designed for use on expeditions to 8000m peaks and in polar environments, they have a very high fill power and a generous sizing to accommodate bulky clothing. The Neutrino Range of sleeping bags are lightweight and minimalist with a breathable Pertex® Quantum outer. They offer a good balance of comfort, weight and warmth. The Morpheus is a versatile down and synthetic hybrid bag. The synthetic base ads durability and enhanced moisture resistance while the down upper improves the warmth of the bag. Our Ignition range use our Pyrotec™ polyester-microfibre insulation, to provide a high level of warmth, without compromising on packability. The Andes Range offers a similar level of warmth to our expedition range but has a narrower, more performance oriented shape that makes them lighter and more packable. The Neutrino Pro range features the same design as our Neutrino sleeping bags with the addition of a water-resistant Pertex® Quantum Pro outer fabric, making them ideal for Alpine bivis. The Alpine Pro range are mid-weight sleeping bags that use a water-resistant Pertex® Quantum Pro outer fabric. They are designed to be a reliable all-round sleeping bag with a good balance of warmth, weight and comfort. Available in a wide range of fill weights, the Ascent range has a wide mummy shape with a roomier fit. The Ascent range is ideal for those looking to buy their first down sleeping bag. Our warmest bags, built for extreme conditions including high altitude and polar expeditions. Designed for winter conditions, these bags tend to be lightweight and performance focused. Designed for regular use, these bags can be used throughout the year. They also represent the best value for those looking to buy their first down sleeping bag. In the the lowest temperature range you’ll find our highest fill power bags, designed to work in polar climates or at high altitude. Our Expedition series of sleeping bags have been used in some of the most unforgiving environments in the world and are sized specifically to fit bulky expedition clothing. The Expedition 1400 is the warmest sleeping bag we’ve ever made, designed to offer warmth and protection in temperatures as low as -40°C (-40°F ). Our Andes 1000 also falls into this temperature band. Offering similar warmth to the expedition range, the Andes is constructed with a more performance oriented shape, considerably reducing packed size and overall weight. The lightest bag in this temperature range is the Neutrino 800 – a minimalist bag designed for uses where warmth to weight is the primary concern. 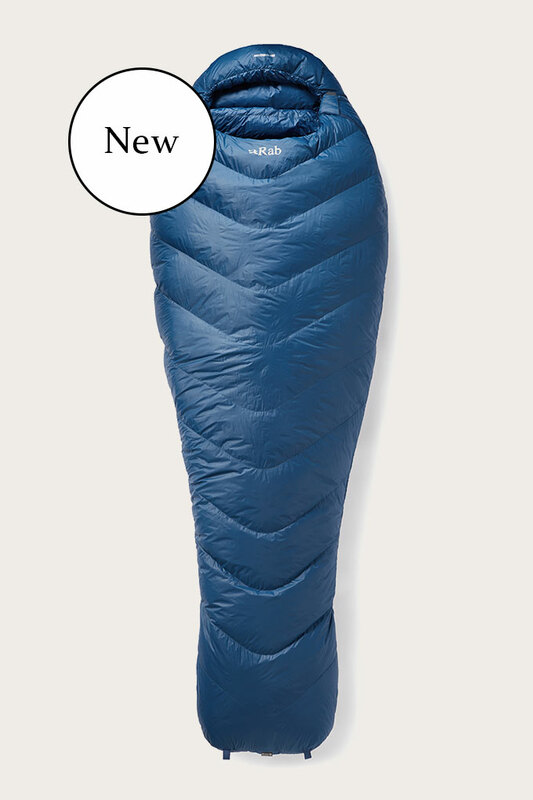 Its tapered shape and lightweight Pertex® Quantum fabrics keep the weight to just 1220g for an 800FP sleeping bag. I've just returned from a high altitude camp at 4,500m in Ladakh - thanks to RAB for producing such a fantastic sleeping bag. Never want to get out! The best bag I have ever slept in. This temperature range includes the Neutrino Pro 600. Designed for alpine climbers the Neutrino Pro range combines the lightweight construction of our standard Neutrino 600 with a moisture resistant outer fabric. 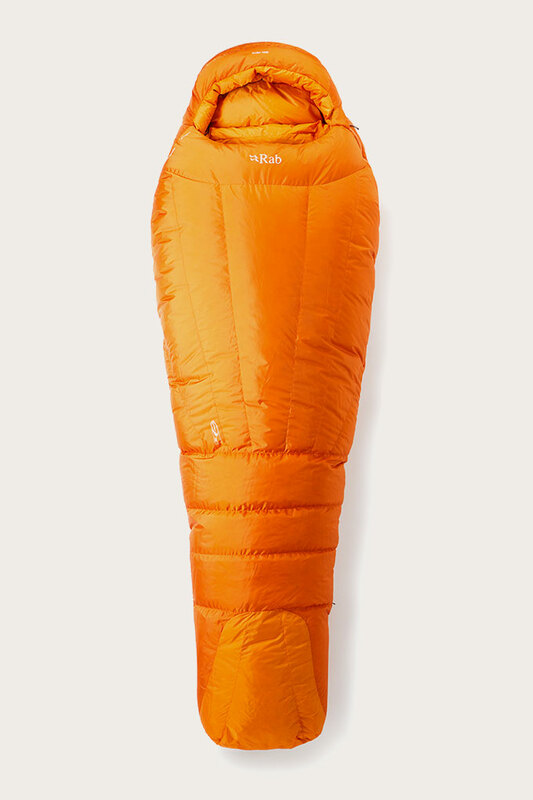 The result is a sleeping bag that will keep you warm in damp conditions and temperatures as low as -14°C (6.8°F), while still packing down to just 22x31cm and 1100g. The Morpheus range aims to combine the best features of down and synthetic insulation by using a down upper and a synthetic base. Because the bottom of the bag is in contact with the ground, and therefore more liable to become damp, we use Pyrotec insulation in this section as it does not lose its insulating properties when exposed to moisture. For the upper, where damp is less of a concern we use 650FP duck down for its excellent heat retention and reduced weight. There's not much more to say. 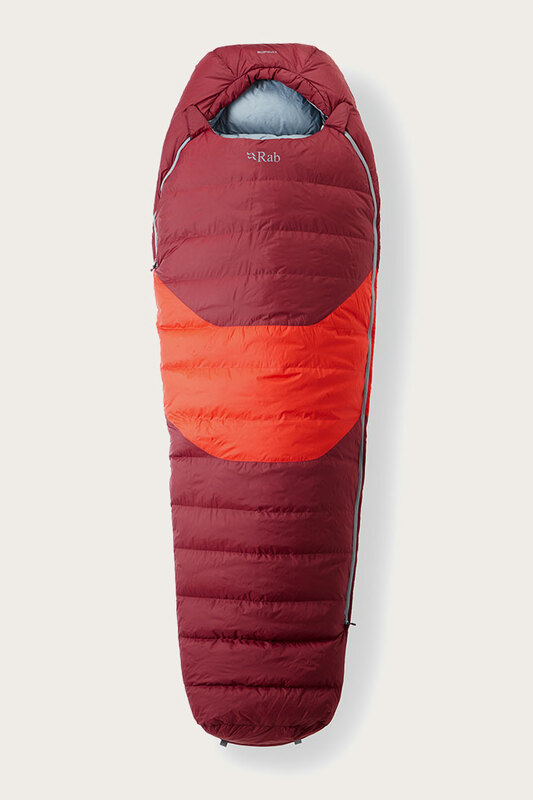 The sleeping bag is well designed and has everything you need. I've tested this sleeping bag during winter in the Lake District, Cairngorms and Nepal and I haven't been cold or disappointed once. It's not cheap but you get what you pay for. Our higher temperature range sleeping bags are perfect for those who aren’t anticipating extreme conditions but still require the technical performance of a Rab sleeping bag. At this temperature, you’ll find our fully synthetic bags, the Ignition Range. Filled with Pyrotec synthetic insulation they’re perfect for use in damp conditions. Fantastic - great fit and fantastic whether it's being used wild camping or in the van. Packs down to a decent size. A well made bag with a surprising level of water resistance. It compresses easily in the waterproof stuff sack provided. Another satisfied customer. Now you know what you're looking for, why not take a look at our full range of sleeping bags? The Responsible Down Standard ensures that the down used in Rab products does not come from birds that have been live-plucked or force-fed and that their welfare has been protected from the moment they hatch. of custody from farm to product, so consumers can be confident that the down and feathers in our products comes only from healthy, well-cared-for animals.